Back to school is just around the corner which means juggling kids, homework, sports, work, etc. is about to get even crazier. While Emerson isn't in school it's rough juggling day care, work, working out, friends and just life in general. Especially when you don't live near any family. Honestly I can't tell you how many times the hubs has come home from work and asked what's for dinner and I didn't have a clue. Those days usually result in takeout or breakfast for dinner because it's easy. 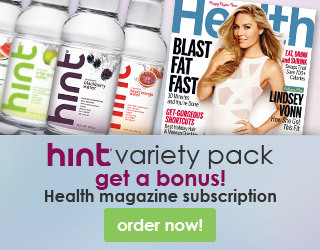 Well I have a secret. 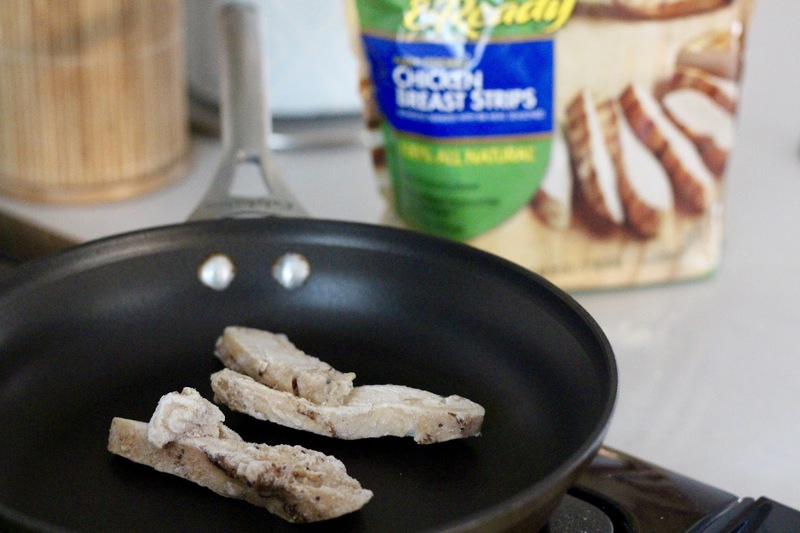 Recently I started purchasing Tyson® Grilled & Ready® Chicken and Tyson® Crispy Chicken Strips for those rough days, days I don't want to cook or just completely forgot to defrost something. Which happens more often than not. Tyson® Grilled & Ready® Chicken and Tyson® Crispy Chicken Strips are awesome because all you have to do is heat and serve -- whether in the oven, stove top or microwave. I was skeptical at first, but I'm kind of in love with the Tyson® Crispy Chicken Strips. They really are crispy, if cooked in the oven. Trust me, pick up Tyson® Grilled & Ready® Chicken or Tyson® Crispy Chicken Strips during your next Walmart shopping trip. 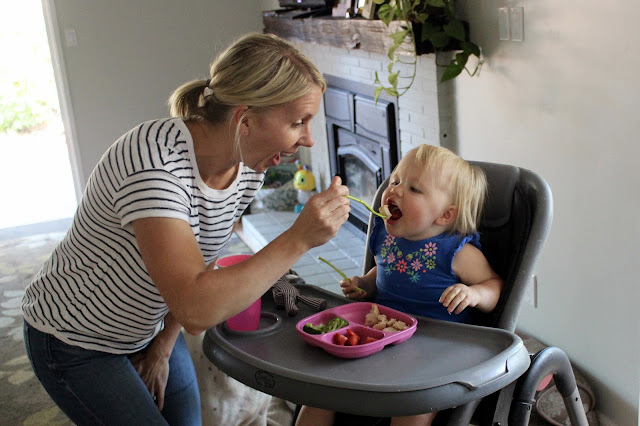 Be the Mom who saves the day and never feels guilty about whatwhen she serves with Tyson Food’s protein packed convenient solutions with TysonⓇ chicken, whether it’s breakfast, lunch, snacks, or dinner. The other day I was having one of those days. The non-stop forget to eat lunch kind of day. Oh and everyone is hangry, but you haven't even thought about dinner let alone defrosted anything. Hello, Tyson® Grilled & Ready® Chicken and Tyson® Crispy Chicken Strips to the rescue. 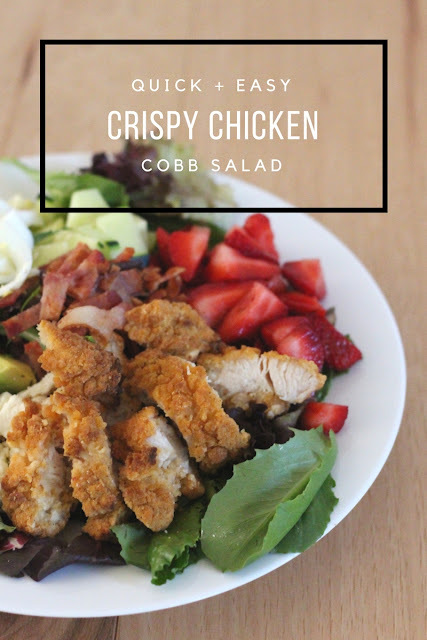 After a quick survey of my fridge I pulled together a quick and easy Crispy Chicken Cobb Salad! 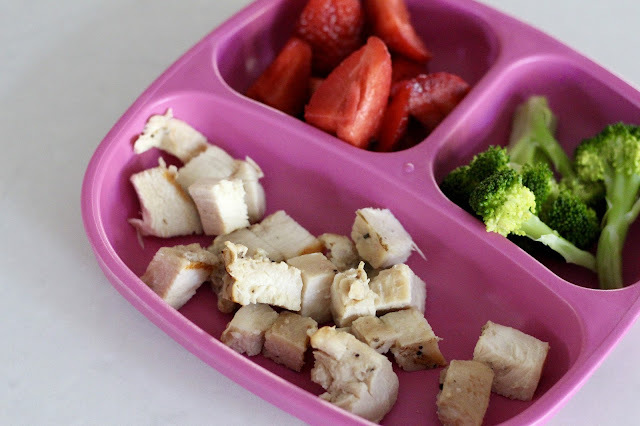 It was amazing and might be on repeat tomorrow ;) For Emerson I heated a few strips of Tyson® Grilled & Ready® Chicken and served with strawberries and broccoli. 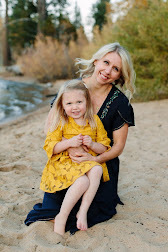 My toddler is easy to please. 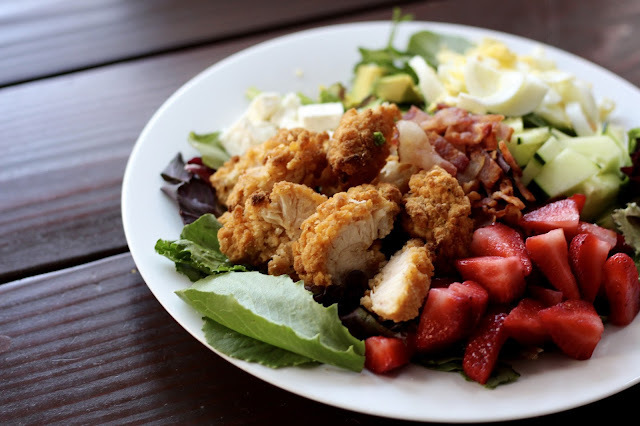 Now for the Cobb Salad a quick meal solution for your family with high quality and low effort. Prepare chicken per directions on package. While chickening in a warming up chop, dice, slice all other ingredients. Using a large plate or bowl layer all the ingredients on top of the spring mix. Top with dressing, toss and enjoy! Yup it's that simple. Pro tip: Make a big batch of hard boiled eggs as your weekly food prep. On Sunday when you're making bacon for breakfast just make the whole package. That way there's extra for the week. Plus, you only have to clean up once. Full tummy means happy hubby and kids! Win, win. 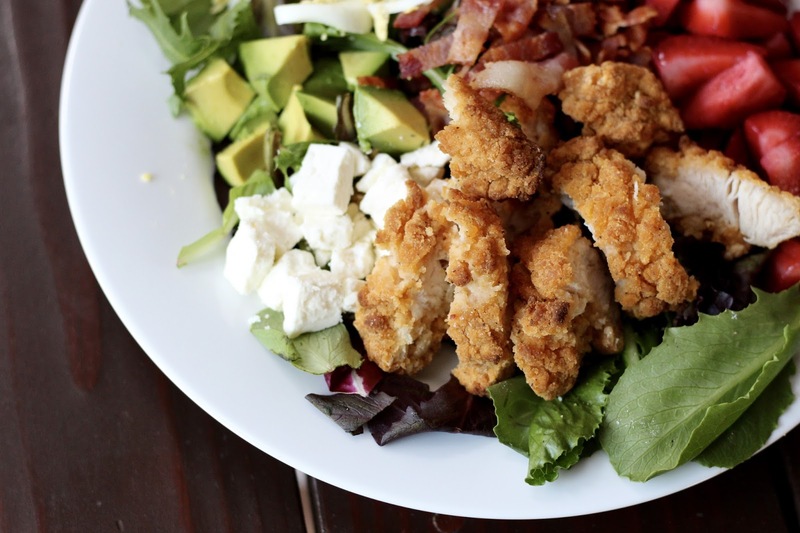 What would you make with Tyson® Grilled & Ready® Chicken or Tyson® Crispy Chicken Strips? Yum, Yum, Yum!! I love Cobb Salads but never used pre-made chicken. Good idea!